Solar Eclipse Photography, Protest Photography, and a Discount on a Drone Conference: Our Top Blog Posts for the Week of August 14-18! It's been quite a week, so take some time to relax and recharge with our favorite photography blog posts from around the web this week! TIPS: A total solar eclipse will be seen in North America on August 21, and DPreview has compiled tips on how to properly photograph this rare phenomenon from trusted sources such as Canon, National Geographic, Nikon, and more. COPYRIGHT: Photographers and creative artists are always looking for ways to make sure their images are protected by their copyright. One popular way to ensure your image has your copyright is to embed your copyright information into your metadata. 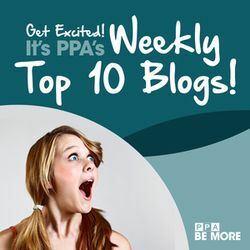 Learn more about it on PPA Today. BUSINESS: Check out this post from Fstoppers to uncover some lucrative reasons why you should consider offering mini-sessions to your clients! Imaging USA 2018: Award and Degree Ceremony's NEW Night! CONFERENCE: PPA's got big news for this year's Imaging USA 2018 in Nashville, Tennessee. For the first time, the Award and Degree Ceremony will be held on MONDAY night, January 15th, instead of on the final night of Imaging USA. Learn more in this article. We all know that composition can make or break a photograph. PetaPixel offers this 7-minute video in which photographer Peter McKinnon offers three tips to help you improve the composition of your photographs. Photographs taken by intrepid photojournalists and documentary photographers have been informing the public and galvanizing people to take action on social issues for over one hundred years. Check out this post from Fstoppers to remember why a picture is worth a thousand words. PPA Discount: InterDrone Convention and Expo! You never know what you'll find out about on theLoop, PPA's members-only social network. Recently, member David Bailey, M.Photog., CPP, shared info about InterDrone, the biggest Drone Conference and Expo in the country... and we've got a special discount for PPA members! The right pose in the right circumstances can make all the difference, particularly when photographing for fashion or advertising. Get a few tips from this PetaPixel article. You'll want to take a moment to enjoy this historical digital archive of images documenting the history of South Carolina. They're among the oldest photos ever taken in this state! World Photo Day takes place Saturday, August 19, celebrating the fact that a photograph can change the world. Register to participate and share your favorite photo! There you have 'em, our weekly blog post roundup! What photography blogs or podcasts do YOU follow? Post your favorites on theLoop or email them to us at OnlineContentCommittee@PPA.com.